Many thanks to Michelle for sharing this fabulous idea - definitely one to try! 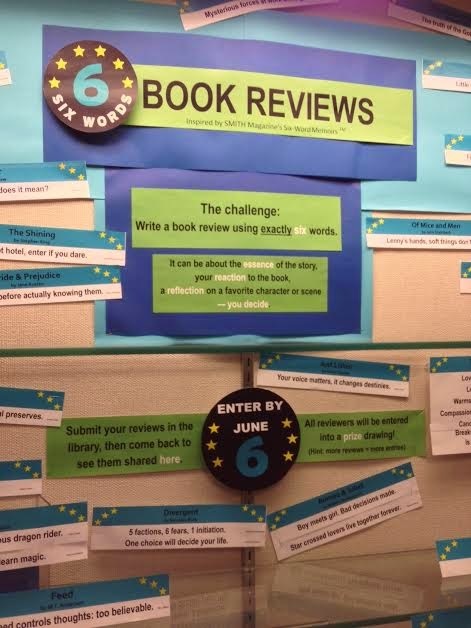 We held a “Six-Word Book Review” challenge this spring, inspired by SMITH Magazine’s six-word memoirs. 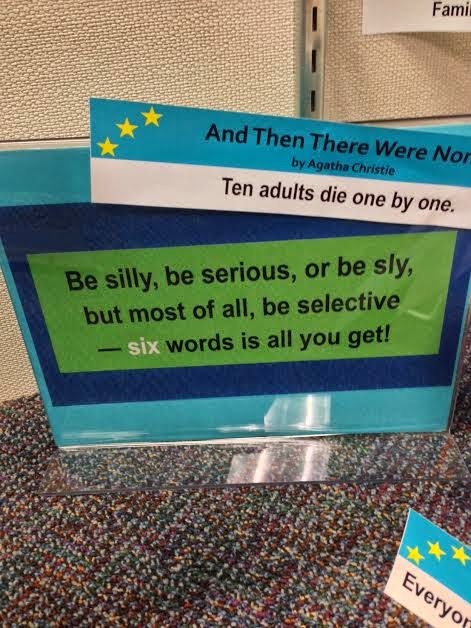 The rules were simple: students and staff could choose any book, and write exactly 6 words about it. Their response could be their reaction to the book, a “teaser,” a summary, description of a character – pretty much anything they wanted to say about the book. I made a short Power-Point presentation so our Language Arts teachers could share the challenge with their classes, and the slideshow also ran on a monitor next to the entry forms in the library. We provided a few examples at the beginning, both in the display case and the Powerpoint, to get students thinking. I typed up new submissions each day and posted them in the display case. We held periodic drawings for small prizes using the submissions as the entry forms, and students could submit as many 6-word entries as they liked. 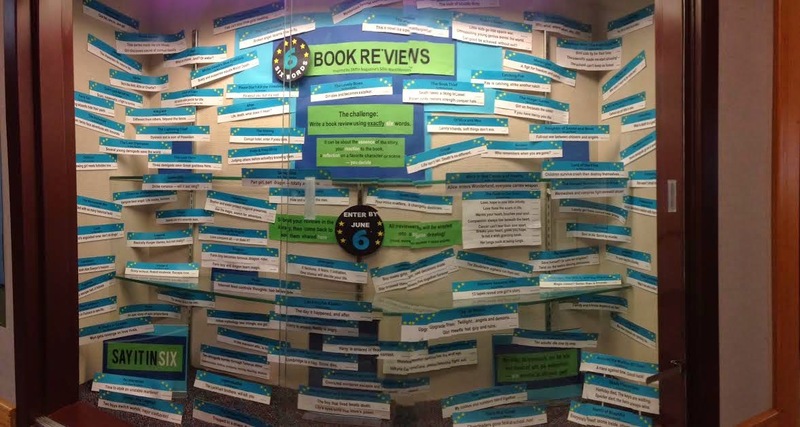 Over the next 2 ½ weeks, we received 133 six-word reviews of 112 different books! Harry Potter and the Order of the Phoenix – Umbridge is a hag. Sirius dies. The Book Thief – Death takes a liking to Liesel. The Shining – Corrupt hotel, enter if you dare. Girls that Growl – Cheerleaders gone feral at school…run! City of Bones – Upgrade from Twilight…angels and demons. Crank – Girl’s anguished verse: don’t do drugs! I could keep going with examples, this challenge brought out so much creativity from our students and we had many excellent submissions. Only a few were generic reviews – the bulk were strongly connected to the specific book. The signage was created using MSPublisher and a color printer. The 6-word logo (upper RH) and “Say it in Six” are from the SMITH Magazine website. I am going to give this a try with my 5th grade classes. Thanks for the idea.